SOME LABOUR MPS in the UK have warned that Theresa May’s speech last night could incite hatred against members of parliament. The British Prime Minister’s address to the nation last night received a poor reception from politicians across the political spectrum. As she attempts to bring her twice-rejected Brexit divorce deal before the Commons for a third time next week May insisted she was on the side of the public and that voters wanted politicians to get on with Brexit and stop in-fighting. “It is high time we made a decision. So far parliament has done everything possible to avoid making a choice,” she said in her TV address. May said she will continue to work “night and day” to get MPs to vote for her deal so the UK can leave the EU by 30 June at the latest. 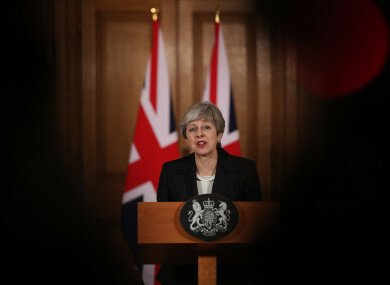 Conservative Sam Gyimah said May “resorting to the blame game” was “a low blow”, while Labour’s Lisa Nandy described the speech as “disgraceful”. Others, however, went further in their criticism, warning that if MPs came to any harm May would be partly to blame. Roberta Blackman-Woods, a Labour shadow minister, wrote that many of her colleagues were facing “real and serious threats” and that May was “being irresponsible and misleading as most of the delay has been due to her running down the clock”. Politicians have warned that the Brexit debate has heightened tensions to the point where they regularly receive death threats and other threatening messages. One MP who spoke to The Guardian recently said she still received death threats every day. Commons speaker John Bercow addressed the coarsening of the Brexit debate in the House today, telling members: “None of you is a traitor … the sole duty of every member of parliament is to do what he or she thinks is right”. Email “Backbenchers warn May 'will have to accept her share of responsibility' if any harm comes to MPs”. Feedback on “Backbenchers warn May 'will have to accept her share of responsibility' if any harm comes to MPs”.